"Bruce?" Bruce who? Bruce Wayne? No wonder you never see him and the Hulk together! This, obviously, is the figure that was pre-painted for the SDCC box set, and is functionally identical - just green instead of red. He has the same flat hair and all the same add-on pieces: fists, feets, thighs, biceps, waist and chest cap. For some reason, the bicep pieces are split on the inside rather than solid, so they fall off easily. Still, this is one big Hulk! And his partner in the set is almost as big! Mike Haggar is a former professional wrestler who became the mayor of Metro City. Taking on the name "Fighting Mayor," he teamed up with his friends and took on the Mad Gear crime syndicate to rescue his kidnapped daughter. Mayor Haggar is one of the three playable characters from Final Fight. While the other two characters (and even some of the villains) became playable characters in Street Fighter games, Mike didn't. Even though he was a former Street Fighter champion. You may recognize him as an internet meme, though: he's the guy who piledrives sharks. 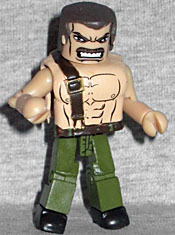 The Minimate's only add-on (other than his hair) is a chest cap, but it's a unique design that's been molded with his trademark single suspender strap. His chest muscles are painted on, and so is his mighty, manly mustache! He definitely looks tough enough to fight Hulk to a standstill. Mayor Haggar has two accessories: a lead pipe, which is a reference to the weapons you could find and pick up off the street in Final Fight; and a tan version of Nightcrawler's bamf that serves as the dust cloud kicked up behind him during his charge attacks. 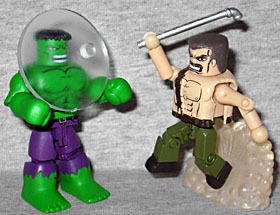 The Marvel vs. Capcom 3 Minimates also include a clear disc base with a foot peg, a development Rustin responded to in his traditionally understated manner. 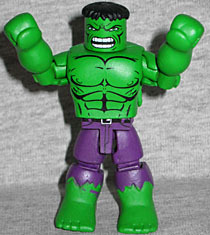 This entry was posted in Art Asylum, MMMR and tagged Capcom, Hulk, Minimates. Bookmark the permalink. oh man final fight was one of my favorite snes games. definitely the one i was most proud of beating.